JPA handles relations between data by using annotations. Imagine a company with a few employees and some cars that are used by employees. Company can have many employees and each employee can have many cars. Create new JavaSE project DerbyTest. Configure project build path to include derbyclient.jar, eclipselink.jar and javax.persistence_2.x.x.jar. First wee need to create three entity classes that will represent database entries and add relations between them. This is done by using annotations. JPA creates tables and relations according to annotations. The file persistence.xml can contain many persistence-unit definitions. PERSISTENCE_UNIT_NAME variable tells JPA which persistence-unit should be used for this application. When running application for the first time, you need to uncomment the lines in persistence.xml to allow JPA to generate new empty tables in database. Check the database to see the tables that were created. You should see that besides tables COMPANY, EMPLOYEE and CAR, two more tables were created: COMPANY_EMPLOYEE and EMPLOYEE_CAR. These two tables store relations between the Company and Employee entities. 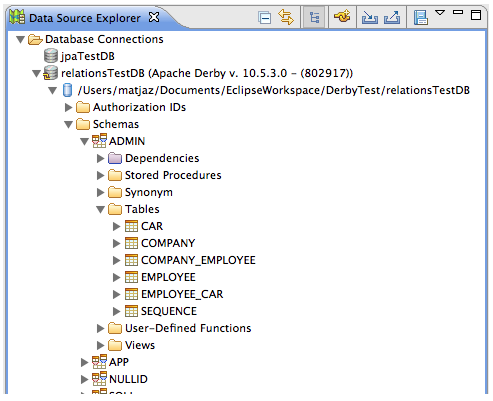 See (here) for help on configuration of database management in Eclipse.